University and college lecturers are being urged to oppose government plans to tackle extremism on campuses. 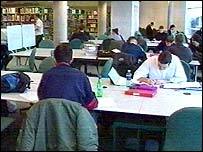 Higher education staff have been asked to report Muslim students who could be suspected of Islamic radicalism. The lecturers are debating whether to co-operate with the request at the annual conference of the University and College Union (UCU) in Bournemouth. Supporters of the motion say although they would report illegal activity, they cannot act as detectives. The motion, put forward by university lecturers in London, warns that such a move would damage the trust between staff and students. In November, the government warned of the dangers posed by what it described as the serious threat posed by radical Muslims. However, many lecturers are unhappy about the role of monitoring, describing it as Islamophobia and a witch-hunt. Sally Hunt, the general secretary of the UCU which represents 120,000 staff, said the motion was likely to receive support. "Academic freedom is something they hold very close to their hearts, it is an absolute key to their profession," she said. "You cannot make it possible for students to explore ideas, if, at the same time, you prescribe how they do that." Professor Anthony Glees, from Brunel University, who has drawn up a report on the danger of campus radicalisation, said there was evidence of elements of extremism on British campuses. When the government advice was issued in November, a statement from the National Union of Students, University College Union, Unison, the Federation of Student Islamic Societies and the Equality Challenge Unit said: "Any implementation should recognise that demonising Muslims is unacceptable and dangerous - whether in educational institutions or in communities. "Students and staff should be assured by their institutions that there is no intention of adding to a climate of Islamophobia."